Stories and myths about giant, hairy bipedal creatures, which resemble a cross between human beings and apes, are found throughout history around the world. They have been given a variety of names, including Yeti, Abominable Snowman, Sasquatch and, in the USA, Bigfoot. Crypto-zoologists debate about whether the creatures are examples of the same species, perhaps a remnant population of hominids which fared badly in evolution and were forced to retreat into remote wilderness regions to escape the ravages of the dominant homo sapiens. Although stories of strange ape-human hybrids had been around forever, the Bigfoot phenomenon first entered the public consciousness in a big way in 1958 when California logger Jerry Crew complained about his work crew being harassed by a mysterious creature which left huge footprints all over his work camp and interfered with the equipment. His claims were greeted with some scepticism so, to back them up, he made a plaster cast of one of the footprints. It was 16” long and 7” wide, huge compared to a human foot. This provoked a reaction. Crew’s claims were now taken seriously and received national press coverage. For obvious reasons, the name Bigfoot was given to the mystery creature and has stuck. Jerry Crew does not seem to have been a publicity hound. Indeed, he seemed rather upset that his work was being interfered with. Few people doubt his sincerity. But some people believe that a trick was played on him : that the footprints were not real, even though Jerry Crew sincerely believed them to be. Ray Wallace - the Father of Bigfoot? When a man called Ray Wallace died in 2002, his family went public with claims that their dead relative was “the father of Bigfoot” because he had faked the footprints Jerry Crew found. A large wooden mould was even produced which, the family claimed, was used to create the footprints. This has led many people to dismiss the Jerry Crew story. Wallace had something of a reputation as a fabulist, however, so his, or his family’s, claims are not necessarily to be taken at face value. Indeed, the mould presented to the public does not appear to be capable of generating the type of prints Jerry Crew saw. A reward was even offered to anyone who could produce fake prints of the type seen in 1958. No one, including the Wallace family, has been able to successfully meet the challenge. 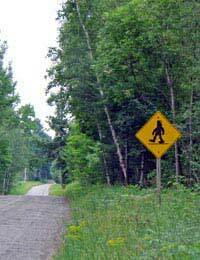 Most subsequent sightings or traces of Bigfoot would also appear in North America’s Pacific North-West region, and they too would be continually dogged by controversy and claims of fraud. The kernel of Bigfoot lore is a 2-minute piece of video footage known as the Patterson film. Taken by Bigfoot aficionado Roger Patterson in 1967, it appears to show a large, hairy man-like creature striding into a forest, turning briefly to look at the camera before disappearing into the trees. The original Patterson film footage wobbled badly as the cameraman struggled to pursue the creature, contain his excitement and photograph it all at the same time. In addition, the actual image of the creature is quite small in relation to the whole picture. Improved versions, which correct the instability problems, and blow the creature’s image up massively, have since been produced. The Patterson film has been intensively studied. There are people who have devoted large portions of their life to poring over its every frame and investigating the circumstances in which it was filmed. There is no doubt that, if it is genuine, it is one of the most significant pieces of video footage ever taken. But is it? Bigfoot believers claim that the Patterson film shows the creature walking with larger strides than a human being is capable of making. In addition, they point out that the appearance of the creature is very difficult to fake. Disney special effects people are quoted as saying that they could not reproduce it. Believers point out that careful examination of the footage shows the creature’s muscles rippling underneath the fur as it raises its leg at one point. For this, a simple gorilla costume would not suffice. Sceptics claim that humans can mimic the gait seen in the film with practice, that the type of foot seen on the creature – with a protruding heel – would be bizarre and unnatural for bipeds. One critic had been a believer until, after intensive viewing of the film, he claimed he could see a fastener on the “costume”. Some believe Hollywood special-effects man John Chambers, who created the costumes for the Planet of the Apes films, may even have been involved, although Chambers himself denied this. Despite the murmurs of scepticism, the Patterson film has never been effectively debunked and continues to mystify and fascinate people until this day. The North American Bigfoot is one of the great enduring myths of our time. It seems especially tantalising to us because it raises the possibility that some kind of primeval creature has managed to eke out an existence amid one of the most advanced technological societies on Earth. For all the people who do not believe the Patterson-Gimlin film is real all you have to do to prove it's a fake is to make another film that looks just like it. You want be able to do that because the film is real. If it can be done once it can be done twice. But so far it hasn't. That's because it's real.